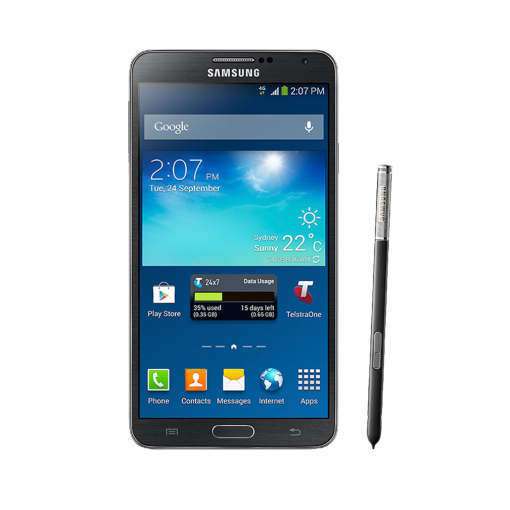 Sell My Samsung Galaxy Note 3 | How Much is My Galaxy Note 3 Worth? Find out how much your used Galaxy Note 3 is worth. Select a condition to receive a quote and get cash for your used cell phone today. Read the full description below for more details. Sell your Galaxy Note 3 for top dollar at GreenBuyback. Select the information above in order to receive an accurate quote for the Samsung Galaxy Note 3 you want to sell. Click sell item if you agree with the price that is displayed. GreenBuyback purchases cell phones, tablets, and laptops at the highest prices in the industry! GreenBuyback pays cash for your old cell phones, tablets, and laptops. When you sell your cell phone, tablet, or laptop to GreenBuyback you will never have to pay shipping. GreenBuyback is dedicated to maximizing the cash back to our customers. Sell your Galaxy Note 3 for cash today! The third generation of Samsung Galaxy Note Android smartphones, the Galaxy Note 3 features an even bigger display screen than the first or second generation Galaxy Note phones. Coming in at an impressive 5.7 inches, this 1080p display is the largest screen on a Galaxy yet. The phone comes with 32GB internal memory with microSD slot, making this a phone with expandable storage. Despite the larger screen size, the Galaxy Note 3 is actually narrower than the second generation Galaxy. GreenBuyback will buy your Samsung Galaxy Note 3 in any condition, even broken! Simply head to GreenBuyback to get a quote, send your Galaxy Note 3 in, and get cash quick! The Samsung Galaxy Note 3 is also one of the first Galaxy phones to not have a glossy rear plastic cover, but instead has a plastic back which could easily be mistaken for leather. Selling a Samsung Galaxy Note 3 Smartphone is so easy with GreenBuyback; send your Galaxy Note 3 phone to GreenBuyback with free shipping and you’ll get cash sent to you fast! Looking to sell a different Android phone model?